I'm really excited to introduce you all to one of my fabulous sponsors: Mattie Luxe! Mattie Luxe is a maker of table eye candy. Specifically, Mattie Luxe creates the most adorable (and reusable) personalized placemats and lucite trays that you ever did see. I am seriously in love with these. Seriously. The fabulous thing about Mattie Luxe is the fact that you get to create completely personalized designs. You choose from Mattie Luxe's huge selection of colors, patterns, and fonts and then personalize each with what you want it to say. Every placemat is completely unique and UP TO YOU! I'm really diggin' the brown patterns, but there are so many other darling patterns, it's astounding. Having a hard time deciding? The Mattie Luxe website will help you with suggestions, most popular patterns, and even a free design service to help you get exactly what you want/need. So here's the fun part, you lucky ducks, Mattie Luxe has generously offered to give one reader of the Shabby Nest a set of 6 personalized placemats!! I'm seriously sooooo jealous of you all!! For extra entries you can (1) Like Mattie Luxe's Facebook Page or (2) Sign up for Mattie Luxe's email list. For entries to be counted, you must leave a separate comment for each. Oh, and if you're not feeling lucky...or your just impatient...or you are just in love and want to buy some placemats right now...Mattie Luxe is currently offering 30% off of ALL placemats! Wahoo!! Giveaway is open until Friday, October 28 at 11:59 pm MST. This post is sponsored by Mattie Luxe. The opinions expressed are 100% mine. I love those place mats! Thanks for a chance to win some. Wow, what a huge selection! I love all of the graphic prints but the animal prints are pretty awesome too. Thanks for the great giveaway! Love!!!! I've been thinking about new place mats lately. Now I know were to get them! To very cute! Love those trays so much. What a cute giveaway! Thank you for hosting! I also joined Mattie Luxe's mailing list :) Hoping to win! I would love to win thank you for hosting! Their placemats are so cute! I love the chevron and the rugby! What a fun giveaway! I love the trays! Thanks! These are sooo cute...even if I don't win I will buy a set for our new home! What a great giveaway! So many cute options! I like Mattie Luxe on facebook! These are lovely - what a great idea to design your own!! I think these just might be my new christmas present ideas! I like Mattie on facebook. Those are super cute. They would look awesome on my table!!! How cool is this?! Can't wait to design one myself! I would love this! Can't wait to go play around with designs! oooh, i would LOVE this!! Have the holidays and chevron on the brain, this would be great for the dining room. Thanks. These are so cute!!! Would love to win! Love! going to order right now! These are so cool. I want to win this giveaway. I like Mattie Luxe on FB. signed up for email list !! love love your blog and love these placemats!! this would be great! i'd love a red and white pattern. thanks for offering this! i just liked them on fb, where they showed off their halloween collection. so cute! Wow, super gorgeous placemats! I just LOVE them! Oh, I also signed up for their email list! I would love 6 of these for our cabin! Pick me! I'm in desperate need of placemats. 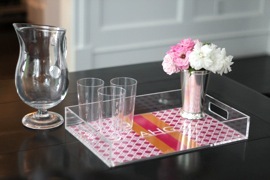 Please enter me for the placemat giveaway! How cool to design your own! Thank you for a chance to win these! My kids will love them and hopefully make sitting at the dinner table easier and more fun! Pick me! Pick me! Seriously, this is a great giveaway. I joined the email list! Love all the polka dots and stripes!! Signed up to receive their newsletter!